One of the best ways to prolong the lifespan of your kicks is by being proactive about sneaker cleaning and care instead of reactive. You can combat future stains by protecting your kicks with a stain repellent. Stain repellents create a durable and breathable shield that repels liquids and stains. So if you are at a dinner party and you drop some pasta sauce on your kicks, that stain won't set and will be much easier to clean if you used a stain repellent before hand. When you schedule a sneaker cleaning with WEEKEND RITUAL be proactive and add on the Stain Protect service. For the most part people clean their sneakers to keep them looking new and fresh. Although “stuntin on’em” is a very important factor, there are so many more benefits to keeping your sneakers clean. Cleaning your kicks prolongs the lifespan of your sneakers, saves you money, and keeps away bad sneaker odor. Odds are you spent a lot of time, energy, and money copping your kicks so I’m sure you want to be able to rock them for as long as possible. The glue and materials in all sneakers break down over time, but dirt, grime, and stains can expedite the break down process. The more often you clean your sneakers the less of a chance the dirt has to interact with the glue and materials in your sneakers. And when it comes to stains, the faster you clean a stain the better. The longer you leave a stain on your sneakers the harder it is to clean because the stain begins to set into the sneaker’s materials. Cleaning your sneakers also saves you a ton of cash. Instead of throwing away those kicks you have that you think are too dirty to wear and then buying a new pair, get them cleaned by an expert who can bring them back to life. What would you rather do? Spend $200+ on a new pair of kicks or $40 that will have your kicks looking like new again. You know that horrible smell that comes from the inside of your kicks? That smell is caused by bacteria living inside of your sneakers. The sweat from your feet combined with how warm and cozy it is inside of your sneaker creates a breeding ground for bacteria. The only way to truly get rid of that smell (and not just cover it up) is to get rid of the bacteria. A professional sneaker cleaning gets rid of the bacteria that causes sneaker odor. Images of a multi-colorway Air Jordan 1 complete with Union LA branding have recently surfaced on social media, which leaves people to speculate a Union LA x Jordan 1 collab is on the horizon. This Union LA X Jordan 1 features a mix and match design approach. The right shoe is made up of the AJ1 “Storm Blue” and AJ1 “Bred,” while the left shoe features elements of the AJ1 “Black Toe” and the never before retro-ed “White/Neutral Grey” colorway from 1985. Also, there is a yellow zig-zag stitching pattern near the “UN/LA” branding. I seriously hope this is not a rumor and this sneaker really drops. A partnership with my favorite Jordan silhouette together with one of my favorite mens shops is a must cop for me. Stay tuned for more info on this collab! What do you think of this possible Union LA X Jordan 1 collab? The dynamic duo, Off-White and Nike, revealed what they have been cooking up lately. This time around it’s an Air Max 97 dressed in black with the usual Off-White x Nike branding (Swoosh logo, “AIR” stamp and Off-White™ industrial branding) found in contrasting. No release date has been confirmed yet, but the Off-White™ x Nike Air Max 97 is said to hit select retailers and Nike SNKRS soon for $190 USD. What do you think of the latest Off-White™ x Nike Air Max 97? 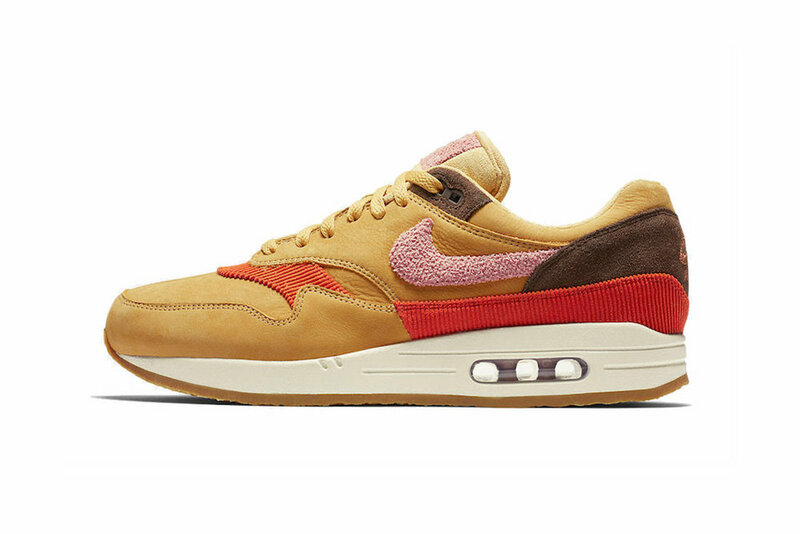 Nike Air Max 1 Premium "Wheat Gold"
This latest iteration of Tinker Hatfiled‘s Nike Air Max 1 adds “Wheat Gold” to its base with chenille on the Swooshes and tongue tab. 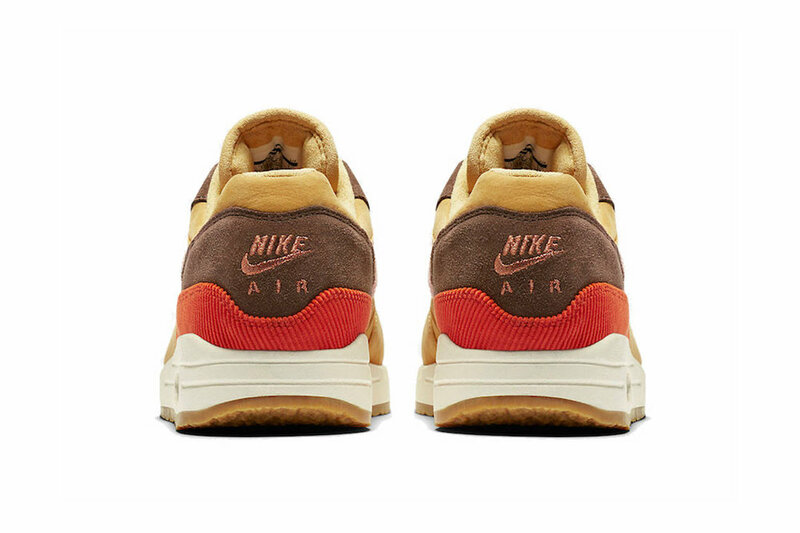 Taking a note from Sean Wotherspoon’s Air Max 1/97, corduroy is added to the upper just above the midsole and across the toebox. The sneaker’s signature visible Air Max unit returns to the heel with the original outsole swapped with a crepe finish. The Nike Air Max 1 Premium “Wheat Gold” will release this November at select Nike Sportswear retailers in addition to Nike.com. Take a look at the photos above and let us know what do you think of the Nike Air Max 1 “Wheat Gold”? John Elliott‘s new Nike Air Force 1 Low collaboration saw it’s first appearance at HYPEFEST and now has released exclusively on the John Elliott website. 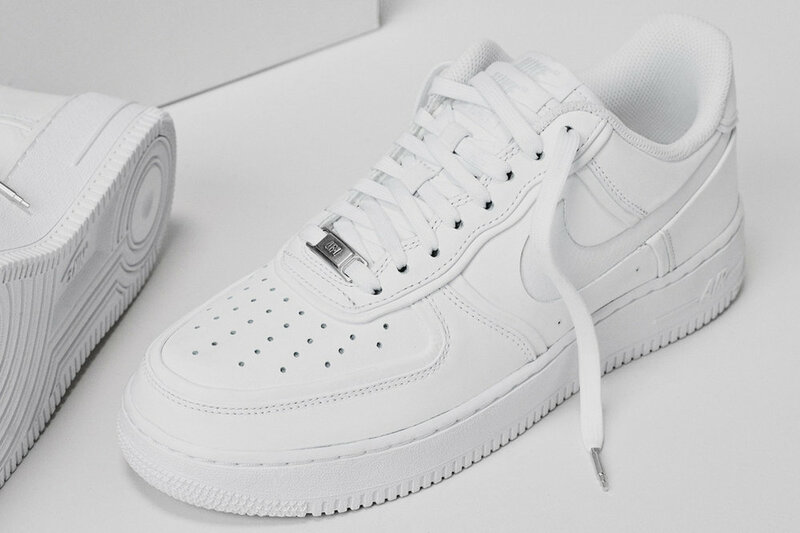 This all white Nike AF1 features a double tongue, a cut away Swoosh, and pebbled leather branding. What do you think of the John Elliott x Nike Air Force 1 Low collaboration? Engineered Garments and adidas Consortium has teamed up on an UltraBOOST. This Engineered Garment x adidas Consortium Ultraboost is dressed in a rich blue Primeknit upper with white accents and a gum sole. In addition, the adidas branding is found in a felt-like material. The Engineered Garments x adidas Consortium UltraBOOST will release on October 20 for €220 EUR (approximately $253 USD) at select Consortium retailers. Let us know what you think of the Engineered Garments X adidas Consortium Ultraoost in the comments below. This clean and mean Air Jordan 11 Retro “Platinum Tint” colorway replaces the signature patent leather upper for a beige leather and nylon upper. The “Platinum Tint” color way also has hits of “University Red” at the ankle panel piping, embroidered Jumpman and lace detailing and sits on top of a white midsole and semi-translucent outsole. The Air Jordan 11 Retro “Platinum Tint” will release on October 27 and retail for $220 at select nike retailers and Nike SNKRS app. Let us know what you think of the Air Jordan 11 Retro “Platinum Tint” in the comments below. Cleaning Sneakers With Premium Materials Is Our Specialty!! Whether it's snake skin, tumbled leather, suede, or Primeknit, the WEEKEND RITUAL sneaker cleaning specialists can clean it all. Our team has years of experience cleaning all sneaker materials. We pay meticulous attention to detail and handle your sneakers with a gentle touch when needed, while still getting out dirt and stubborn stains. When Cleaning Suede Sneakers, Don’t Forget To Use Protection! Scheduling a cleaning for some suede kicks? Don't forget the suede protect add-on. Our suede protect spray creates a shield that repels liquids and stains.